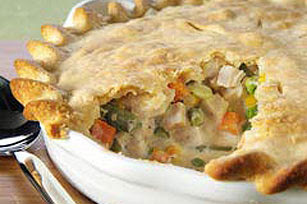 One of the tried and true comfort foods is Chicken Pot Pie. It doesn't matter if it's summer or winter, if you're sick or well, going through a bad time or just stressed out, a really good chicken pot pie seems to help make it all better. My mother never made homemade pot pies but always bought the frozen ones from the store; as a result, I never really cared for them. However, a few years ago while visiting a friend for the weekend, I had the great fortune of eating a pot pie made by a woman who was very well known for her recipe. Oh. My. God. It was to die for! I called begging her to give me her recipe but she refused. So, I picked that silly thing apart until I pretty much knew what was in it (but not entirely, not the "secret" ingredient) and certainly not the quantities. I've searched high and low for a recipe that might be close to hers and I think I've finally found it. I've made it and if this isn't the exact recipe, it is darn close. Let me know what YOU think! Preheat the oven to 350. Salt and pepper the chicken and place it in a baking dish in a single layer. Pour the cream over the chicken and bake for 25-40 minutes, depending on the size of the chicken breasts. Remove the chicken from the cream, reserving the cream for the sauce. Once the chicken has cooled, cut it into 1 inch pieces. Boil potatoes for 10 minutes, then add the carrots and cook until both the potatoes and carrots are fork tender. Drain and set aside. Sauté onions and celery in butter. Sprinkle in the flour; stir and cook 5 minutes, but do not brown. Remove yolks from egg slices. Slowly add the broth to the onion mixture, whisking until the sauce smoothes out and thickens. Add the egg yolks, cream, cognac, tarragon, thyme, salt and pepper. Mix well and cook 5 more minutes. Add the chicken, potatoes, carrots, egg whites and frozen peas to this sauce and mix gently. I love homemade pot pies. This recipe looks fabulous!